Two days before our visit the National Trust had to close Lydford Gorge. At the reception desk we were shown the pictures: torrents gushing everywhere and displaying a blatant disregard for structures like bridges and platforms. Anyone in the wrong place at the wrong time could well have been swept away. But let's go back a bit first. In the car, heading towards Okehampton, the clouds are ominous with a capital 'O'. I'm no meteorologist but I reckon we're in for a wet one. My intention had been to head for Lydford High Down, out in the open. Dodder (a parasitic plant that resembles those red liquorice bootlaces from the tuck-shops of yesteryear) is found there on gorse. But when the showers rain down like nails it forces a rethink. Though there are 77 different weather seals on the Pentax K5 this does not make the camera waterproof. Neither of us wishes to test it to the limit. In heavy rain, it's always best to err on the side of caution. We need to be under cover and head for Lydford Gorge accordingly. The car park is, unsurprisingly, almost deserted. Even though we are soon changed and appropriately suited and booted, I don't think the girl at reception believes our claim that we will be back at four o' clock, almost five hours hence. Surely no sane individual would be out longer than an hour in these conditions? Things being as they were, it did not bode well on the photography side. Light is fundamental to capturing things clearly. Though the low light capabilities of cameras has come on in leaps and bounds, it's still no substitute for the right light. On the rare occasions when flash has been used as a last resort, the results have been regrettable - overly bright and harsh or completely bleached, washed-out highlights. So we were reliant on the high iso numbers. Focusing down on the ground, away from the light is even trickier. At iso 3200 the results are manageable - just. 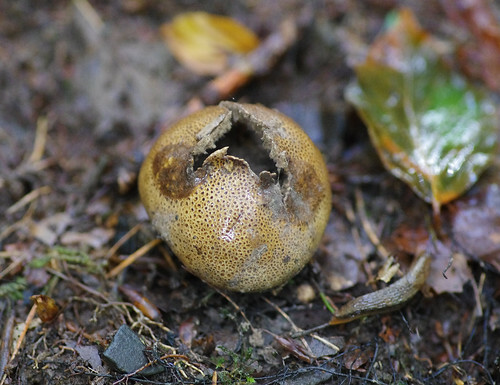 The Leopard Earthball can be identified by its recurring pattern. 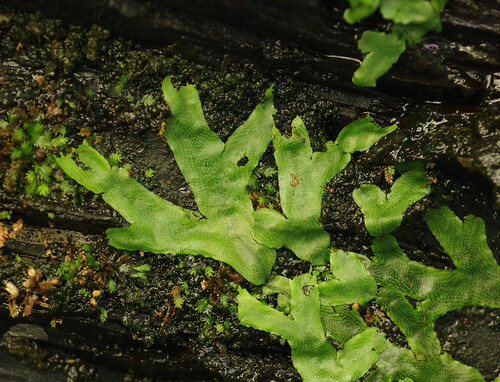 To identify this fern I looked at the spore pattern and finally the shape of the pinnules (the name for the individual parts branching off the side stems. And a rare breaking light interval in the background helped enormously. 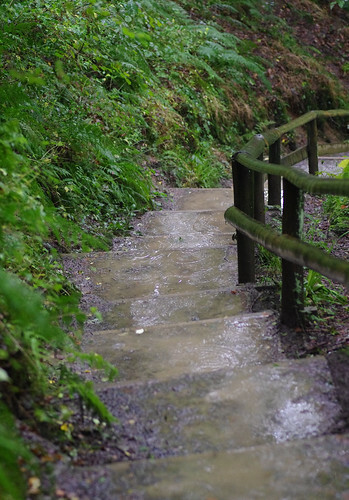 The steps were intent on becoming a waterfall in their own right. Though we were partly under cover we were always going to get soaked. 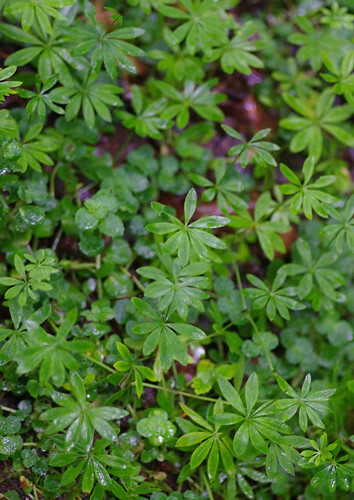 There were carpets of these lush, green leaves but their white flowers had long since gone. 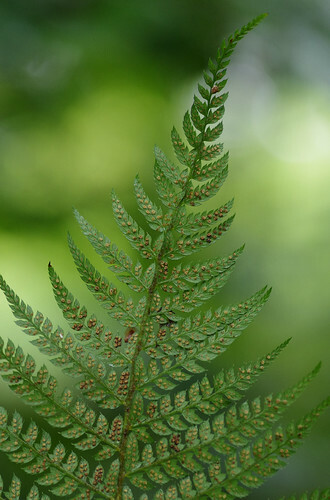 Sherry took a number of other fern and fungi pictures but they did not come out. Through the trees, the way ahead seemed to get darker and darker. We made our way round and turned off the main path for the cafe. 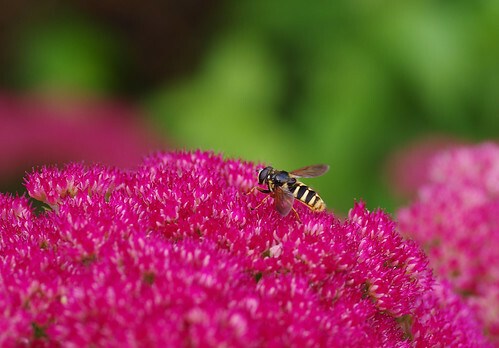 Unknown hover fly outside the cafe. In a matter of seconds the fly was gone. After a quick hot drink we resumed along a disused railway track before descending once more to the river and the waterfalls. 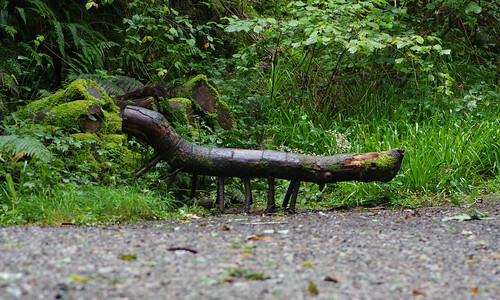 Sometimes, the presence of sculptures and installations outdoors can seem a bit overpowering and detract from the beauty and atmosphere of a place. But at Lydford they somehow seemed to complement the surroundings. Dramatic settings can easily influence the invention of legends. Settings that look and feel sublime and awe-inspiring can also seem strangely unreal. In the case of Lydford, legends have sprung up about the Gubbins family: a sort of fierce, fearsome, cattle-stealing band of ginger pixies. Presumably you would know one if you saw one. Not that any gnome, ghost or anything else for that matter would be out and about on a day such as this. 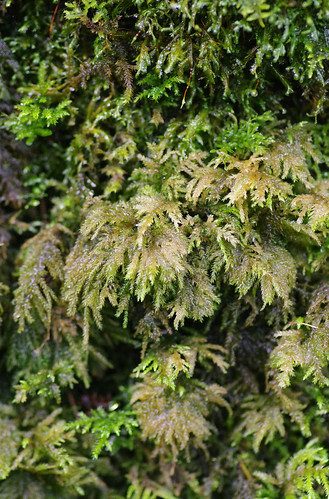 I really must endeavour to try harder with mosses. I need a hand lens, an exhaustive but portable guide and a good deal of patience. The leaves of Opposite-leaved Golden Saxifrage (Chrysosplenium oppositifolium) are shown on the right. 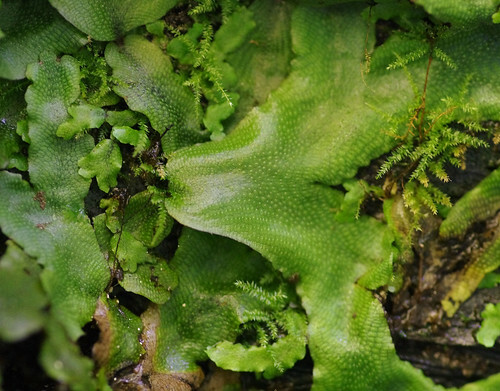 The lettuce-type leaves on the left probably belong to a species of Liverwort. 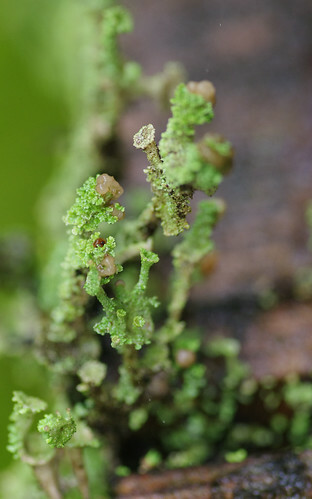 With their tentacles and slimy surfaces these lichens possess something monstrous and alien. 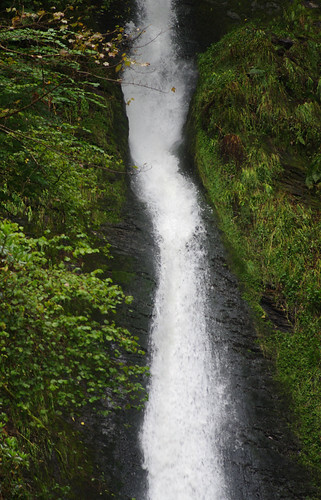 One of the waterfalls at Lydford Gorge. 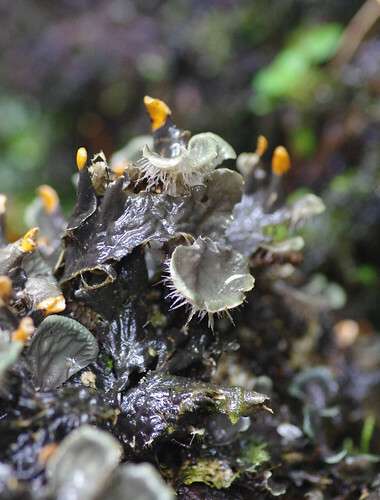 These lichens were on the wet wooden platforms. Usually Lady is fearless when she sees water. 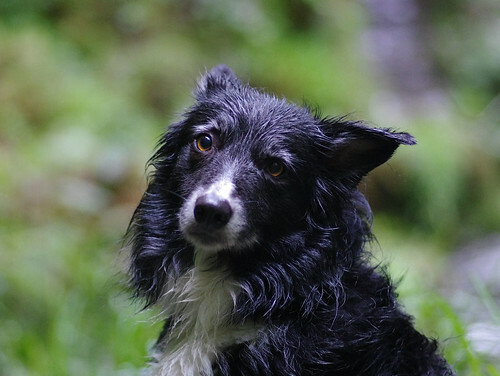 But our poor collie was not enamoured of the blasting torrents and displayed a modicum of sense. On the narrow, slippery paths, she clung as far to the inside wall as possible. 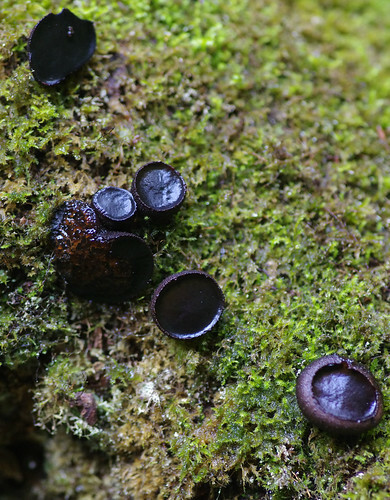 These specimens are either the wonderfully named Witches' Butter or Black Bulgar. 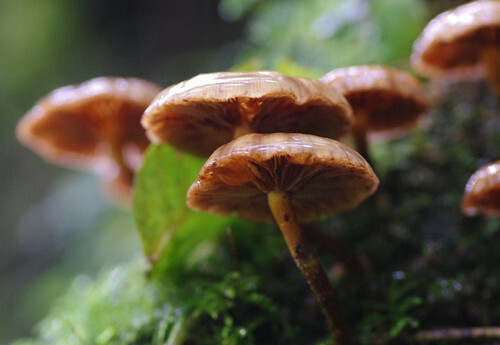 Apparently, the way to tell them apart is to take a spore print. Next time I will have to bring a pad and hope for a dry day. 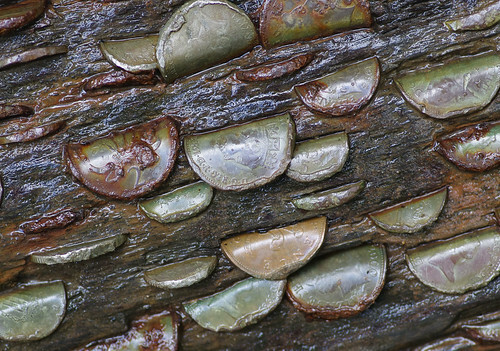 This huge log was literally covered in copper coins that had been bent and wedged. Rust had taken its toll. I wonder if this was a variant of wishing wells or a form of pagan offering to the trees. 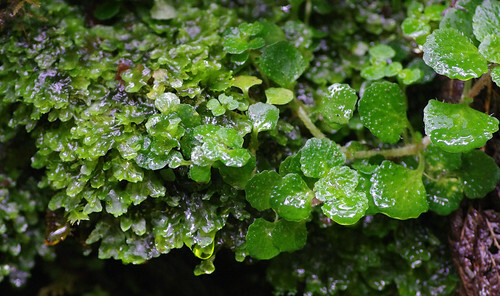 Finally, we were impressed by these liverworts. I can't remember coming across these before. Their tongue-like form appeared to be plastered over the surfaces of the wet rocks. Or had they stretched themselves along? 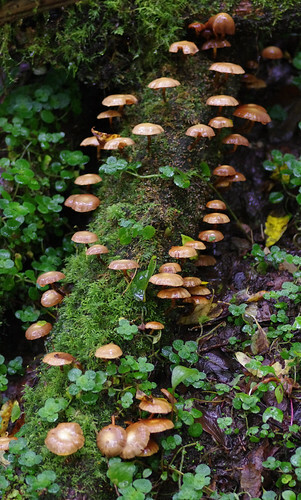 I will have to find out more about liverworts. Another field guide is needed and many more hours of head-scratching must surely follow. A full four hours after we had set out, we returned to reception: soaked to the skin, replete with many photos and memories. We bought a National Trust guide to add to our collection. It will prove an invaluable resource for our next visit and beyond. Hopefully then the woodland flowers will be out in force and the sky will be raining only light.